This article was featured in the Winter Edition of my newsletter. Sign up above to get the newsletter delivered directly to your email. The idea of facing the holidays without someone you love is painful and magnifies the sense of loss. Holidays are filled with traditions that may not seem the same anymore. It is helpful to plan ahead and create new ways of approaching and marking the holidays. 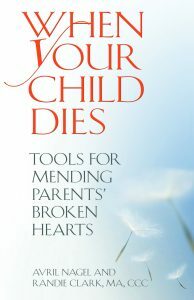 The following excerpt from When Your Child Dies: Tools for Mending Parents’ Broken Hearts provides some ideas and strategies for coping. Only do things you want to do. Keep things as simple as possible. Allow yourself to talk about your grief and your loved one. Consider the needs of the family and make decisions as a group. Find a way to make special tribute to your loved one. Skip the holiday gatherings and traditions if you want to. Make sure to take the time to be alone if you need it. Give yourself permission to have fun. Acknowledge that emotional pain during the holidays is normal and will likely occur. Be vocal about your needs. Ignore or change old traditions as feels right. If you are grieving this holiday season, I encourage you to reflect on what is most important to you over the next month. How would you like to acknowledge your loved one through the holidays? Are there new traditions or activities that you would like to incorporate such as volunteering or a special ornament commemorating your loved one? Or, do you want to celebrate the holidays at all? Listen to your heart and determine what works best for you and for your grief. Parents who have suffered the death of a baby through miscarriage, stillbirth or post-natal death also look to the holidays with a certain sense of dread and uncertainty. Unlike other losses, the memories of the baby are limited and instead parents are faced with grieving memories unformed. All the imagined holiday’s and moments shared suddenly become impossible and parents are cruelly reminded of the potential they have lost. Despite this, the grief of parents who have lost babies often goes unacknowledged during the holidays and parents may feel isolated in their grief. If someone in your life has recently suffered the death of a baby, be open to discussing and acknowledging the sense of loss and grief they may feel in light of the holidays. If you have suffered the loss, consider new traditions that you can introduce that acknowledge the love and longing you feel. There are six ornaments on my tree for Alden, one for each Christmas without him. Making these ornaments has been a ritual that creates the space I need to bring him into my heart and mind over the holidays in a calm, quiet, loving way. Wishing you all a peaceful, truthful and calm holiday season. Copyright © 2019 Avril Nagel.